Once again the confusion over language, religion and terrorism in Australia has led to some funny, if very sad and stupid, conflations. The latest concerns an Optus telephone store in a shopping center in Sydney which advertised in Arabic. The problem? Terrorism. As many Islamic terrorists are either Arabic-speaking or from a wider diaspora (even if they were born in Europe) the language has become a stand-in for terrorist, for some. In fact the Optus signs said little more than they had a staff member who spoke Arabic and could help out customers in their language. This upset occurred after the Paris attacks. In multicultural Australia signs and public service announcements in other languages are common; you might find a gambler’s help ad in Vietnamese around Melbourne’s North Richmond or signs in Hindi in Dandenong. Apart from the odd confused yob yelling, “speak Australian!” few seem to care. Optus also pointed out that they advertise in Chinese and Vietnamese and that Arabic is spoken by over 200 million people in 20 nations. 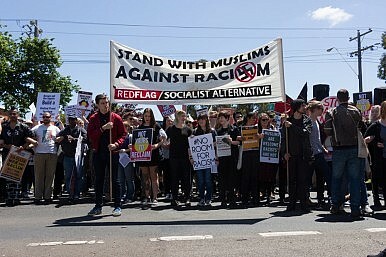 Mariam Veiszadeh, the president of Islamophobia Register Australia was quoted in the same story as saying, “We need to safeguard our socially cohesive and multicultural society against these misconceptions about Muslims and the Islamic faith.” And the biggest misconception might be that Arabic and Islam are interchangeable when they are not. All things Islam and by extension Arabic have worried a larger majority for some time. Even Australian staple spread Vegemite came in for attack as “terrorist food” after it began to display a Halal certification. Critics suggest Halal certifications, which can be costly, fund terrorist groups by an ABC investigation by program Four Corners earlier this year found no evidence. Of a population of close to seven million 1.77 million were born overseas and 1.55 million speak a language other than English, according to 2011 data. The same data says that 83 languages are spoken in New South Wales. Conflation of one thing with another is not limited to Arabic speakers; spare a thought for five-year-old Illawarra girl Isis, refused her own personalized jar of Nutella. Racism has no place in society and Australian politicians from all sides of politics are making full awareness of this fact.